Brian Peter George Eno, known more simply as Brian Eno or just Eno to his friends, is one of the UK's most respected electronic musicians. As co-founder of the original Roxy Music, the man's flamboyant character, penchant for feather boas, futuristic hair styles and glam rock threads made him an instantly recognisable face back in the day when Roxy first emerged as an act to rival David Bowie. His groundbreaking synthesiser playing, gift for ambient sonic noise and refusal to be typecast by the normal parameters of rock music have seen him established as a collaborative force who has produced, amongst many, U2, Coldplay and Talking Heads and been allied to Bowie himself on the so called 'Berlin trilogy' of Low, Heroes (he co-wrote the legendary title track) and Lodger. Often viewed as a super brained polymath, modern renaissance figure and intellectual deconstructivist, all these high falutin' terms shouldn't deflect attention away from a keen musical mind with an ability to fuse pop sensibilities and avant garde innovation, often within the same piece. He is certainly a one off. Eno. The one. And only. Although he started his adult life with a view to becoming a painter, Brian Eno was the kind of student who also taught others. Utilising musical forms to make a point he became fascinated by the possibilities of synthesised Moog sounds and began to build his own machines while at college in Suffolk. Eno's desire to explore theory over practice and an ongoing infatuation with Germanic 'krautrock' made him the ideal candidate to offset Bryan Ferry's rock and roll crooner persona in Roxy Music. 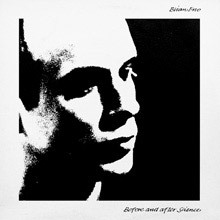 Looking like no one else on the scene Eno's synth signature is all over the Roxy debut and For Your Pleasure but he became tired of mainstream success and pursued an active solo career from 1973 onwards. Eno's first four albums - Here Come the Warm Jets, Taking Tiger Mountain (By Strategy), Another Green World and Before and After Science - are master classes in emerging electronic pop, albeit in a style imbued with a rather British sense of humour. For all his intelligence and acumen Eno's work is never without a smile to dismantle accusations that the music he makes is po-faced. Here Come the Warm Jets, a big selling chart album thanks to Roxy's increasing fan base, features most of his former band members as well as kindred spirit Robert Fripp and members of Matching Mole and Pink Fairies. One can already see that the main man is providing a link from underground sounds of the late sixties and the new torch bearing spirit of seventies pre-punk decadence. Well dressed and chic as ever this art rock statement contains excellent vignettes like 'Baby's On Fire', the twisted Egyptian garage lurch of 'Needles In The Camel's Eye' and the funky 'Dead Finks Don't Talk', where soon to be Talking Heads bassist Busta Jones hints at sounds yet to arrive. Taking Tiger Mountain (By Strategy) could almost be a precursor to the video games age. 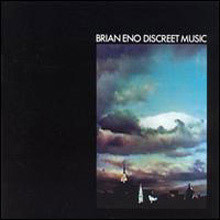 Darker than its predecessor, this intricate Chinese puzzle of an album was partially born from an idea Eno called 'Oblique Strategies', which he devised with artist Peter Schmidt as a kind of prototype computer programme. With songs like 'Burning Airlines Give You So Much More' and 'The True Wheel' (co-written by Phil Manzanera) Eno was now becoming known as a kind of Sci Fi Disney, melding nostalgia, advertising, Japanese comic book culture references and futuristic fantasies. To say he was ahead of the pack would be an understatement. Another Green World (whose title track is familiar as the opening music for the BBC series Arena) bamboozled many on release with a common reaction expressing surprise at a new ambient direction, though in truth the seeds had been sewn long before. In any case, as is often the way with Eno, what seems downright weird at the time will eventually become other people's normality. Ironically, AGW, is now viewed as one of the greatest seventies records of all. And so it goes. The side project Discreet Music has lush classical overtones while Before and After Science marks his last foray into what one might loosely term standard rock music, though best to avoid labelling Eno where possible! Here you'll find Eno working with artists from the folk field, the German masters from Can, kindred spirits Roedilius and Moebius, mates from the Canterbury scene, members of Free and Phil Collins. A heady brew by any standards this album wasÂ inspired in part by the artist seeing Talking Heads playing in Manhattan and reawakening his love for left field pop. As someone who had participated in events with Kevin Ayers, the Velvet Underground's John Cale and long time pal Manzanera Eno's next moves were as producer (for the Heads' classics Fear of Music and Remain In Light) and as creator of the Ambient Series. So we get Music For Airports, Music for Films (both imaginary and real), the krautrock gem After the Heat, More Music for Films and Thursday Afternoon, the latter hitting the mid point of the 1980s with an approach whose desire was to fill space. Now linking up with Daniel Lanois, the Quebec born producer with a somewhat similar sensibility, Eno had forged his very own take on ambience. 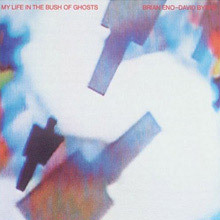 Four years earlier he would return to a form of mainstream with the sublime My Life in the Bush of Ghosts, a completely successful collaboration with David Byrne. It's probably taken the intervening period for many to catch up with that marvel since the concepts of found sound, World Music and sampling, though by no means totally new, were still an alien concept to many. The album's audacious fusion of speaking in tongues, snatches of Lebanese radio and pure soul music were a revelation at the time. So there you have him. Or in a sense you don't because Brian Eno is always moving on even when he appears to be at his stillest. Definitely one of the most important figures in popular music he remains a figure of calm with the ability to cause chaos at any time. Investigation is strongly recommended. 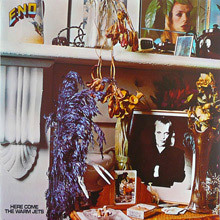 Eno's solo debut, Here Come the Warm Jets, is a spirited, experimental collection of unabashed pop songs on which Eno mostly reprises his Roxy Music role as "sound manipulator," taking the lead vocals but leaving much of the instrumental work to various studio cohorts (including ex-Roxy mates Phil Manzanera and Andy Mackay, plus Robert Fripp and others). 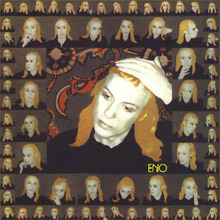 Eno's compositions are quirky, whimsical, and catchy, his lyrics bizarre and often free-associative, with a decidedly dark bent in their humor ("Baby's on Fire," "Dead Finks Don't Talk"). Yet the album wouldn't sound nearly as manic as it does without Eno's wildly unpredictable sound processing; he coaxes otherworldly noises and textures from the treated guitars and keyboards, layering them in complex arrangements or bouncing them off one another in a weird cacophony. Avant-garde yet very accessible, Here Come the Warm Jets still sounds exciting, forward-looking, and densely detailed, revealing more intricacies with every play. Continuing the twisted pop explorations of Here Come the Warm Jets, Eno's sophomore album, Taking Tiger Mountain (By Strategy), is more subdued and cerebral, and a bit darker when he does cut loose, but it's no less thrilling once the music reveals itself. It's a loose concept album -- often inscrutable, but still playful -- about espionage, the Chinese Communist revolution, and dream associations, with the more stream-of-consciousness lyrics beginning to resemble the sorts of random connections made in dream states. Eno's richly layered arrangements juxtapose very different treated sounds, yet they blend and flow together perfectly, hinting at the directions his work would soon take with the seamless sound paintings of Another Green World. Although not quite as enthusiastic as Here Come the Warm Jets, Taking Tiger Mountain is made accessible through Eno's mastery of pop song structure, a form he would soon transcend and largely discard. A universally acknowledged masterpiece, Another Green World represents a departure from song structure and toward a more ethereal, minimalistic approach to sound. Despite the stripped-down arrangements, the album's sumptuous tone quality reflects Eno's growing virtuosity at handling the recording studio as an instrument in itself (a la Brian Wilson). There are a few pop songs scattered here and there ("St. Elmo's Fire," "I'll Come Running," "Golden Hours"), but most of the album consists of deliberately paced instrumentals that, while often closer to ambient music than pop, are both melodic and rhythmic; many, like "Sky Saw," "In Dark Trees," and "Little Fishes," are highly imagistic, like paintings done in sound that actually resemble their titles. Lyrics are infrequent, but when they do pop up, they follow the free-associative style of albums past; this time, though, the humor seems less bizarre than gently whimsical and addled, fitting perfectly into the dreamlike mood of the rest of the album. Most of Another Green World is like experiencing a soothing, dream-filled slumber while awake, and even if some of the pieces have dark or threatening qualities, the moments of unease are temporary, like a passing nightmare whose feeling lingers briefly upon waking but whose content is forgotten. 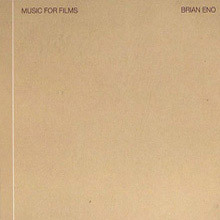 Unlike some of his later, full-fledged ambient work, Eno's gift for melodicism and tight focus here keep the entirety of the album in the forefront of the listener's consciousness, making it the perfect introduction to his achievements even for those who find ambient music difficult to enjoy. The latter part of 1975 was a remarkably creative period for Brian Eno. 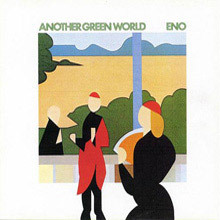 With his masterpiece Another Green World, Eno began moving away from the structure and sound of pop music toward a more static instrumental model, influenced in part by Erik Satie and strongly informed by his prior collaborations with Robert Fripp. Recorded just a month after Another Green World, Discreet Music is his first full foray into what has become known as ambient music. Using the same system of two reel-to-reel tape recorders as No Pussyfooting and Evening Star, Eno was able to layer simple parts atop one another, resulting in a beautiful piece of music that never really changes but constantly evolves with the addition and decay of different parts. And while there were elements of noise and dissonance on the albums with Fripp, all the sounds here are calming and serene. The second half of the album deals with the same ideas of recurring themes and evolution but uses a different approach. Here, members of the Cockpit Ensemble use pieces of the score of Pachelbel's Canon in D Major, but the relation of these elements changes over time by having the parts slow at differing intervals or using different lengths of the musical score. The same notions of theme and constant variation appear, but without the aid of the tape delay system. The tones of the strings are vastly different from the synth tones of the title track, but the effect on the listener is the same, with the pieces delicately unfolding over time. Discreet Music's reputation as a groundbreaking and influential work is surpassed only by its placid beauty. Highly recommended. Before and After Science is really a study of "studio composition" whereby recordings are created by deconstruction and elimination: tracks are recorded and assembled in layers, then selectively subtracted one after another, resulting in a composition and sound quite unlike that at the beginning of the process. Despite the album's pop format, the sound is unique and strays far from the mainstream. Eno also experiments with his lyrics, choosing a sound-over-sense approach. When mixed with the music, these lyrics create a new sense or meaning, or the feeling of meaning, a concept inspired by abstract sound poet Kurt Schwitters (epitomized on the track "Kurt's Rejoinder," on which you actually hear samples from Schwitters' "Ursonate"). Before and After Science opens with two bouncy, upbeat cuts: "No One Receiving," featuring the offbeat rhythm machine of Percy Jones and Phil Collins (Eno regulars during this period), and "Backwater." Jones' analog delay bass dominates on the following "Kurt's Rejoinder," and he and Collins return on the mysterious instrumental "Energy Fools the Magician." The last five tracks (the entire second side of the album format) display a serenity unlike anything in the pop music field. These compositions take on an occasional pastoral quality, pensive and atmospheric. Cluster joins Eno on the mood-evoking "By This River," but the album's apex is the final cut, "Spider and I." With its misty emotional intensity, the song seems at once sad yet hopeful. The music on Before and After Science at times resembles Another Green World ("No One Receiving") and Here Come the Warm Jets ("King's Lead Hat") and ranks alongside both as the most essential Eno material. Words - David Ross Smith. Four subtle, slowly evolving pieces grace Eno's first conscious effort at creating ambient music. The composer was in part striving to create music that approximated the effect of visual art. Like a fine painting, these evolving soundscapes don't require constant involvement on the part of the listener. They can hang in the background and add to the atmosphere of the room, yet the music also rewards close attention with a sonic richness absent in standard types of background or easy listening music. Recorded intermittently between 1975 and 1978, Music for Films compiles moody, instrumental electronic pieces intended as soundtrack material for imaginary motion pictures; the songs are brief and fragmentary, ranging from the haunting "Sparrowfall" to the luminous, densely layered "Quartz." 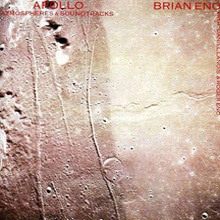 An exquisite experiment, Apollo takes Brian Eno's spacescapes from albums like Another Green World and arranges them with some heavenly pedal steel guitar by Daniel Lanois. The recording engulfs the listener and captures the feel of space travel, weightlessness, and other sensations vividly. It's also perhaps Eno's warmest record ever. In the end, it comes off sounding not unlike a Grateful Dead experiment, with Lanois' lazy pedal steel sounding quite similar to Jerry Garcia's playing on David Crosby's "Laughing." An excellent nighttime vehicle. Eno's music has held up remarkably well in face of the enormous changes that have occurred in the realm of pop-oriented electronic music since the last of these tracks were laid down in 1983. 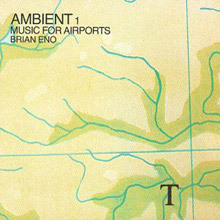 Relatively few of these pieces jump out at the listener, and the overall mood fits comfortably within the realm of his ambient music, but taken as a whole the collection has a tad darker atmosphere than, say, Music for Airports. 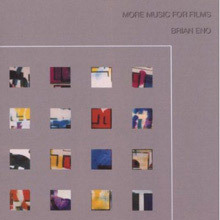 The running time of More Music for Films is certainly more generous than the average entries in Brian Eno - The Soundtrack Series, and even though it is not as essential as the original Music for Films collection, it nonetheless affords a fascinating glimpse into Eno's workshop during his early days -- a period some might say was Eno's best. A pioneering work for countless styles connected to electronics, ambience, and Third World music, My Life in the Bush of Ghosts expands on the fourth-world concepts of Hassell/Eno work with a whirlwind 45 minutes of worldbeat/funk-rock (with the combined talents of several percussionists and bassists, including Bill Laswell, Tim Wright, David van Tieghem, and Talking Heads' Chris Frantz) that's also heavy on the samples -- from radio talk-show hosts, Lebanese mountain singers, preachers, exorcism ceremonies, Muslim chanting, and Egyptian pop, among others. It's also light years away from the respectful, preservationist angles of previous generations' field recorders and folk song gatherers. The songs on My Life in the Bush of Ghosts present myriad elements from around the world in the same jumbled stew, without regard for race, creed, or color. As such, it's a tremendously prescient record for the future development of music during the 1980s and '90s.